What exactly is the Amicale? In French, the word ‘amicale’ means friendly. 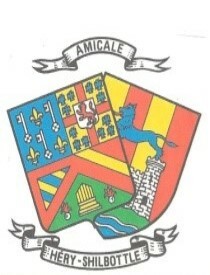 So the ‘Amicale’ association is a ‘friendly’ association between the villages of Shilbottle and Héry, in France. It began in 1963 when a lady called June Raynal and her husband Jean were sent to Shilbottle by the Mayor of Héry, to negotiate a treaty of friendship between the two villages. Before the end of the year, two associations with the same name, invented by a teacher in Héry called Daniel Desseaux, were set up in both villages and the Amicale Héry-Shilbottle Association was born. The first French visitors were hosted by the villagers of Shilbottle in 1964. Then, in 1965, a group from Shilbottle made a return visit to Héry. Since then, forty-eight exchanges have taken place between Shilbottle and Héry, 1121 people have crossed the Channel to see their friends who live ‘overseas’. Who were June and Jean Raynal and why did they choose Shilbottle? June Raynal was a local girl who studied French at university, went to work in France, met and married a Frenchman – Jean – and finally settled down in the village of Héry. It was she who first had the idea of creating a kind of twinning between the two villages she knew so well. From the very beginning, rather than an official twinning, she wanted to create a friendship association between the two villages. At that time, Shilbottle was considered to be absolutely perfect for a ‘twinning’ with Héry: there were strong, personal ties between the two villages as June’s auntie and uncle still lived in Shilbottle; the villages were about the same size; they each had both a rural and industrial population; each village had a primary school and secondary schools in nearby towns; each village had a key industrial activity and they were very similar – the coal mine in Shilbottle and the Davey-Bickford factory in Héry which made detonators and explosives for mines and quarries. Héry is near Auxerre, in Burgundy, about 100 miles south east of Paris. Burgundy is a very beautiful and historic area of France – like Northumberland. Burgundy is particularly well known for the production of high quality red and white wines. In fact, Héry is very near the village of Chablis which is famous for producing one of the very best white wines in the world. How often do the ‘exchanges’ between Shilbottle and Héry take place? Every summer, families from one village welcome guests from the other village to stay in their homes for about a week. Hosts and guests enjoy organised visits to local places of interest and some free days. Costs are modest because the visiting group pay for their own flights and the host group provide meals and hospitality. Throughout the year, the Amicale Association in each village holds social events and organises fund raising activities, the proceeds from which are used to pay for trips and social events in the years when our respective villages act as hosts. In many cases, links have been made between families of the two villages who have gone on to share events that occur in family life such as births, weddings, birthdays, Christmas cards and sadly on some occasions, deaths and periods of mourning too. According to the terms of the Treaty of Friendship, if you live within the Parish boundaries of Shilbottle, you are automatically a member of the Association. Over the years, this has been extended to include members from Alnwick, Swarland, Newton on the Moor, Lesbury Warkworth, Amble and Eastfield. Some family friendships have developed over three generations but new members are warmly welcomed and several members of our current group have joined recently. People often start by joining in some events which take place during the year, before deciding how much to get involved.